We at Mountain Mike’s Pizza believe passionately in being active participants in the community we serve. We proudly provide support to organizations and groups that better our community through education, youth and adult supports, development of the arts, charitable acts and spiritual leadership. Mountain Mikes Pizza delivers your Business Savings. We know budgets are tight and resources are limited, yet you still need to take care of your employess. We can help with 25% OFF Office Parties, meetings, or just can’t get away… Its’s fast, easy, and delicious. Make your event complete by adding salads, wings, appetizers and soft drinks. 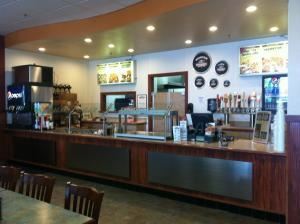 Mountain Mikes new business programs grants a 20% food discount to any employee whose order total $20 or more to be delivered at their job site. We have PARTY room available for office meetings, conferences, parties, wedding rehersals. Our restaurant can accommodate big sports groups.